← Oh Me. What Would the Peeps Do? OK. I’m feeling a bit better today. Because it’s Wednesday and time for some StuART! And, because y’all helped me out of my funk about going over the rainbow bridge. If you’re just joining us, don’t worry, I’m fine. But some of my pals crossed over recently. You know what? All of my friends would be waaayyyy mad at me for wallowing in sadness. So…on to the celebration of life and how we all help each other along when we need to, right? Right. Enough of sadness. Whaddya think of this little new watercolor ditty? That means it’s time for some StuART. A little kulcha’ never hurt anybody. So ponder this watercolor I made just for you. 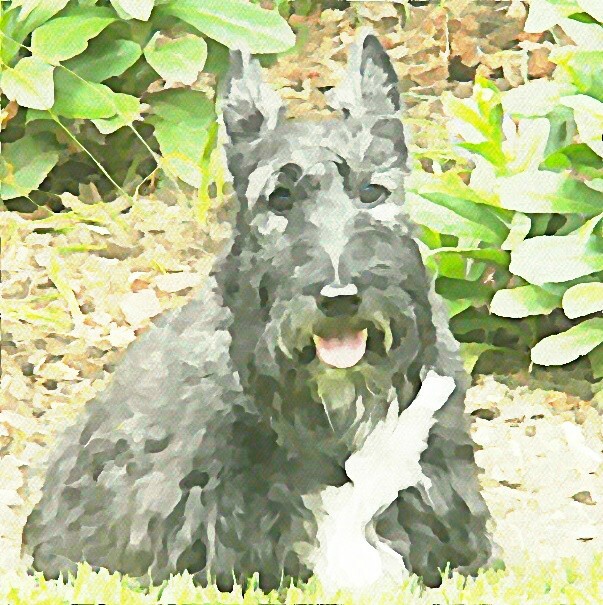 This entry was posted in Terriers, The Scottie Chronicles, Uncategorized and tagged art, death, dogs, grief, losing a friend, losing a pet, mourning, pets, Scotties, watercolor. Bookmark the permalink. Stuart I am still in a funk. Brilliant! Love the pink tongue. Glad you’re back! Thank you! My tongue seems to be hanging out a lot lately. Tooooo hot. Stuart – you need to pop over to my bloggie and listen to my favorite song. Dat will cheer ya up. I can’t bark at you at your place!!! THAT IS MY VERY FAVORITE SONG OF ALL TIME. My peep sings it to me. Thanks, buddy, for cheering me up even more. You, as always, are sooo right! Stuart, Jazzi wouldn’t want you to be morbid all the time. Lighten up on yourself and start enjoying life again. No, she wouldn’t. And you don’t either my fluffy wuffy. I’m back! Don’t worry about your Peeps crossing the rainbow bridge together — I would drive to your house and take you to live with me. If you needed a place to live. I love Scotties and have 3 waiting for me when I cross over. Glad you are feeling better. That makes me cry. That’s so sweet of you to be my safe home if I needed it if my peeps go. They’d be there waiting for me on the other side, too. Along with BoBo. The Scottie of all Scotties. Right Stuart, I’ve been thinking the same things and yeah they wouldn’t want us to be sad. The hard part is the missing them part. Luv your family, and be happy. That IS the hardest part. Stay strong Jazzi’s family. She’s with you every day. And every night. She’s with all of us. Bless her. Welcome back, Stuart! You look relaxed and happy in today’s watercolor! It’s nice to be back. Thanks you guys!!!! Oh Dalton. That makes me feel even better! Bacon, Bacon, Bacon….life can be a struggle can’t it? But it takes pals, like you, to bring it all together.